This is a new little section on my blog and as it sounds, I am going to review things, from books to albums to products. Although its not my usual type of post I know that it's going to be helpful to quite a lot of people and that's why I'm doing them, so look for ones that may be relevant for you. I will of course be doing my usual blogs but hopefully once or twice a month be doing a post like this. I actually have two other posts planned for this week one which I'll definitely be uploading tomorrow so you should get three posts in one week you lucky things you. Anyway I'm sure quite a lot of you have the same problem as me and recently I've been trying salt sprays for my hair, I've tried two so far and I'll be adding to it as I go probably leading to another review about them. 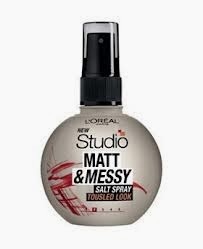 Although my hair is quite thick, it lacks quite a lot of volume as it is naturally quite straight which is why I've been trying them, and the two I have done so far is got2B beach matt (£3.99 at Superdrug) and L'Oreal studio matt and messy(£3.75.) They are both matt texturizing salt hair sprays. First, the L'Oreal one I liked a little better, it had a nicer texture when it was in my hair and it brushed out a little easier. It plumped my hair up nicely although I had to keep using it as it seemed to not stay in for very long. The pump on the bottle annoyed me quite a bit I'm not sure if that was just my bottle but it seemed really hard to push down and it doesn't seem to give much out at one time so I have to use quite a lot of it on my hair as its quite long, it didn't have much of a 'spray' The smell kind of annoyed me after a while it was okay at first but I think if I used it every day I'd have a lot of headaches. It didn't weigh my hair down which was what I loved about it, my hair felt really light! If you spray too much of it in one place it can be a little sticky however! Overall I'd give it 7/10! The second, got2B I wasn't a massive fan of I just didn't like the texture of it, it left my hair feeling quite wet and a little sticky. It definitely adds volume to curls and waves so I think I'd recommend curling your hair before of if you have naturally curly and thin hair then this would be a good product! I liked the pump so much better it had a really good spray and its a lot prettier to look at packaging wise. It didn't leave your hair feeling gritty or anything but it wasn't as light as the L'Oreal one. It didn't make my hair heavy but the L'Oreal one made it so light. It smells better too, it smells like suncream I think it definitely smells summery! Unlike the L'Oreal one this one adds waves so if that's what you were going for then I'd recommend this one! 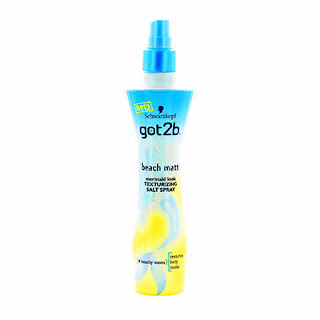 This is a summery product I think perfect for beaches but what the heck, wear it all year round. Overall I'd give it 6.5/10. I will be back tomorrow with new years resolution post so I'll see you then my dears. If you have anything you'd like me to review no matter what it is email me my emails at the side.